Here’s a trivia question for armchair historians: Was the first Memorial Day celebrated in Columbus, Georgia, or Columbus, Mississippi? According to strict calendric interpretation, Columbus, Mississippi, celebrated the holiday first, on April 25, 1866, but only because newspaper editors fudged the date, said Richard Gardiner, an associate professor of history education at Columbus State University in Georgia, and co-author of “The Genesis of the Memorial Day Holiday” (Columbus State University, 2014). Columbus, Mississippi, may have celebrated Memorial Day first, but “what’s not true is that they came up with the idea,” Gardiner told Live Science. In fact, there are many contenders for where Memorial Day started. Some say it started in Waterloo, New York, in 1866, and President Lyndon B. Johnson even signed a proclamation saying so in 1966. But historians have since discredited that claim, Gardiner said. Still, some people still trumpet the claim, including the village of Waterloo itself. Here’s why: In the 1880s, a reporter interviewed a source who thought that Waterloo celebrated the day in 1866, but the newspaper later ran a correction saying it was actually 1868. Still, not every newspaper that ran the story included the correction, leading some people to think that Waterloo was the first to celebrate the holiday that Americans call Memorial Day, Gardiner said. Others, including David Blight, a professor of history at Yale University, say the first Memorial Day happened in Charleston, South Carolina, according to The New York Times. On May 1, 1865, workmen honored and buried dead soldiers from the Union Army at a racetrack that had been turned into a war prison, Blight told The New York Times. However, there’s no evidence that this event sparked the national holiday, Gardiner said. People have honored dead soldiers and decorated their graves since the beginning of time, he added. Memorial Day’s date has changed over the years, but the very first holiday was planned for April 26, 1866, in the wake of the American Civil War. In January 1866, the Ladies’ Memorial Association in Columbus, Georgia, passed a motion agreeing that they would designate a day to throw flowers on the graves of fallen soldiers buried at the cemetery, Gardiner said. However, the ladies didn’t want this to be an isolated event, so Mary Ann Williams, the group’s secretary, wrote a letter and sent it to newspapers all over the United States. In the letter, the ladies asked people to celebrate the war’s fallen soldiers on April 26 — the day the bulk of Confederate soldiers surrendered in North Carolina in 1865. But the date wasn’t printed correctly in every newspaper, which led Columbus, Mississippi, to celebrate the holiday a day earlier, on April 25. Despite the mix-up, Columbus, Mississippi, is often credited as the birthplace of Memorial Day, Gardiner said. In one of his 2010 weekly addresses, President Barack Obama said just that: “On April 25, 1866, about a year after the Civil War ended, a group of women visited a cemetery in Columbus, Mississippi, to place flowers by the graves of Confederate soldiers who had fallen at Shiloh,” he said. Gardiner said, “I don’t contest that. But the evidence is abundantly clear that they were simply following what the newspaper had suggested that they do.” Rather, it was the women of Columbus, Georgia, who thought of the idea, he said. On April 26, 1866, people across the South heeded Williams’ letter and threw flowers on the graves of Civil War soldiers. Some Southern women noticed that Yankee graves, interspersed with the graves of their loved ones, sat untended, Gardiner said. 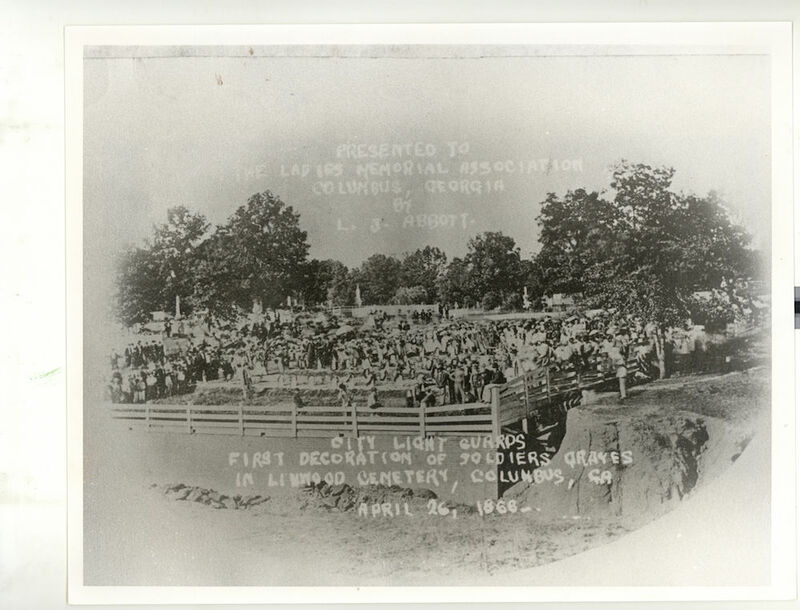 The Memorial Day celebration on April, 26, 1866, in Columbus, Georgia. Many Southern women repeated the practice on April 26 in 1866 and 1867, and in 1868, “the story was just so strong and so well known that the authorities in the North said, ‘Look, we’ve got to take this thing and make it national,'” Gardiner said. In May 1868, the day became a federal holiday. But there were few, if any, flowers blooming in the North in April. So, the government pushed the date up a month, to May 30, so that people could decorate the graves of fallen soldiers with wildflowers, Gardiner said. As the holiday spread, people placed flowers on the graves of Confederate and Union soldiers, even if one had been a former enemy. For instance, in 1868, a girl named Jennie Vernon in Indiana sent a wreath with a letter to officials, asking that they lay flowers on a rebel soldier’s grave, according to Gardiner . “My dear papa is buried at Andersonville [Georgia], and perhaps some little girl will be kind enough to put a few flowers upon his grave,” she wrote. Memorial Day’s many changes underwent scrutiny, however. When it became nationally recognized in 1868, some Northerners resisted, saying they shouldn’t follow a Southern idea. Likewise, some people in the South were upset that the North was “stealing” their idea, Gardiner said. That’s why some Southerners still celebrate Memorial Day on April 26, he said. But overall, the holiday has brought people together. Americans still honor it today, with celebrations and remembrances of people who have died fighting for their country, Gardiner said.